This Tuesday (Jan. 4) will be a busy day on the celestialcalendar. Before sunrise, one of the most prolific displays of "shootingstars" will take place. For skywatchers in Europe or parts of Africa andWestern Asia another great sky show awaits: a partial eclipse of the sun.? But to catch the best views of these two sky shows ? the firstmajor skywatchingevents of 2011 ? it's best to be prepared, and dress warmly. Here's a lookat this week's skywatching bonanza, starting with the Quadrantid meteor shower. Early each January, the Quadrantid meteor stream?provides one of the most intense annual meteor displays, with a brief, sharp maximumlasting only a few hours. 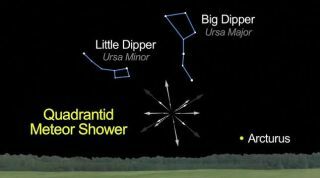 This Quadrantidmeteor shower skywatching guide shows where and how to look in thenortheastern sky to spot the shooting star display. The meteors actually radiate from the northeast corner ofthe constellation of Bootes, the Herdsman, so we might expect them to be calledthe "Bootids."? But back in the late-18th century there was aconstellation here called Quadrans Muralis, the "Mural or WallQuadrant" (an astronomical instrument). It is long-obsolete star pattern,invented in 1795 by J.J. Lalande to commemorate the instrument used to observethe stars in his catalogue.? Adolphe Quetelet of Brussels Observatory discovered theshower in the 1830?s, and shortly afterward it was noted by several astronomersin Europe and America. So they were christened "Quadrantids" and eventhough the constellation from which these meteors appear to radiate no longer exists,the shower's original moniker continues to this day. At greatest activity, probably 50 to 100 shower membersper hour should be seen. However, the Quadrantid influx is sharply peaked: sixhours before and after maximum, these blue meteors appear at only a quarter oftheir highest rates.? This means that the stream of particles is a narrow one ?possibly derived relatively recently from a small comet.? In fact, in 2003, astronomer Peter Jenniskens of NASA founda near-Earth asteroid (2003 EH1) that seemed like it was on the right orbit to bethe sourceof the Quadrantid meteor shower. Some astronomers think that this asteroidis really a piece of an old, "extinct" comet; perhaps a comet thatwas recorded by Chinese, Korean, and Japanese observers during the years1490-91. According to that theory, the comet broke apart and someof the pieces became the meteoroids that make up the Quadrantid stream. In 2011 a strong display of Quadrantid meteors is likelyfor Europe and points east to central Asia.? Maximum activity is expected at around 0100 GMT onTuesday, Jan. 4 when the radiant of this shower ? from where the meteors appearto emanate ? is ascending the dark northeastern sky. With no moonlight tointerfere, this might turn out to be one of the best meteor displays of theyear. Morning twilight will not interfere until about 6 a.m. local time. What about for North America?? At the time the shower isreaching its peak, it will be Monday evening, Jan. 3 on the other side of theAtlantic; 8 p.m. EST in the East and 5 p.m. PST (still twilight) in the West. ?The radiant will be positioned low near the north-northwest horizon.? As a consequence of the low altitude, only a fraction ofthe 50 to 100 shower members will likely be seen.? But those "Quads" that are seen, will likely bespectacular "earthgrazers" that skim across our upper atmosphere on long,majestic paths.? By 1 a.m. EST (0600 GMT) on Jan. 3, the radiant will beclimbing in the northeast sky, but the meteor rates will be rapidly declining.? East of the Mississippi, you might still count arespectable 20 or 25 per hour; west of the Mississippi, perhaps more like 5 to15 per hour. And who knows? As meteor expert, Allistair McBeath hasnoted, some Quadrantid outbursts in the past have been several hours early orlate. If the latter happens this year, it could lead to higher hourly rates forNorth America. If you do head out to look for meteors, remember tobundle up with blankets and a comfortable chair! The same rules apply as towhat we suggested last month with the December Geminid meteor shower. After viewing the spectacle of a fine meteor shower onTuesday morning, skywatchers over Europe, the northern half of Africa andwestern Asia will then be treated to a bonus and ? weather permitting ? be ableto enjoy the spectacle of a partial eclipse of the sun. The moon?s outer shadow ? called the penumbra, from wherethe partial eclipse will be visible ? will scrape the northern part of theEarth. First, a note of caution: Bevery, very careful about the precautions for eclipseviewing!? Never look at even a tiny bit of the sun?s disk without proper lightfilter. The safest way to view a solar eclipse is toproject the sun?s image either through a pinhole or through binoculars or atelescope (but at no time should you look through the pinhole or binoculars ortelescope at the sun!)? You?ll get useful solareclipse viewing safety tips here. ?Be sure to observe them! The Jan. 4 partial solar eclipse will first appear inAlgeria, the second largest country on the African continent. The first contactof the penumbral shadow (where the sun rises with a barely perceptible nick inits southern edge) coincides with local sunrise a few hundred kilometersnortheast of In Salah, an oasis town in central Algeria, at theheart of the Sahara Desert region of northern Africa.? Ultimately, the shadow will envelop nearlyall of Europe, the northern half of Africa, the Middle East, and southern Asia. From this spot on Earth, looking along thebrow of our planet toward this U-shaped sun might convey to some a sensation ofthe moon's tubular shadow hurtling overhead and onward into space.? Cities in Western Europe will also enjoy asunrise eclipse, with the striking spectacle of a partially eclipsed sunemerging into view from beyond the east-southeast horizon. London will see 66.7percent coverage at 8:12 a.m. Local Time; Madrid, 46.8 percent coverage at 8:52a.m. Local Time; Paris, 64.9 percent coverage at 9:09 a.m. Local Time; andOslo, 77.9 percent coverage at 9:35 a.m. Local Time in Norway. All times given here are for local standardtime. It should be pointed out that we are providing values pertaining to the obscurationof the sun, by the moon, which refers to the total area of the sun?s diskthat is being covered. This is not to be confused with the magnitudeof the eclipse, which refers to the fraction of the sun?s diameter that iscovered. NASA astronomer, Fred Espenak has calculatedthe GMT/UT observation conditons for 65 selected cities in Europe, Africa andAsia, which includes both the obscuration and magnitude values. You can see theentire citylist by clicking here. The shadow sweeping eastward, leaves theEarth's surface, in the Eurasian country of Kazakhstan, to the north of LakeBalkhash about 4 hours and 21 minutes after it first touched down in Algeria. Good viewing to you ? and no frustratingcloud cover!